Horatiu Cirstea and Santiago Escobar. 3rd International Workshop on Rewriting Techniques for Program Transformations and Evaluation (WPTE 2016), Porto, Portugal, 23rd June 2016. Electronic Proceedings in Theoretical Computer Science, volume 235. 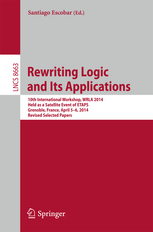 Rewriting logic and its applications (extended selected papers from WRLA 2014). Special Issue of Journal of Logical and Algebraic Methods in Programming. Volume 86, Issue 1, Part 2, Pages 157-297 (January 2017). Volume 85, Issue 1, Part 1, Pages 1-120 (January 2016). Yuki Chiba, Santiago Escobar, Naoki Nishida, David Sabel, Manfred Schmidt-Schauß. 2nd International Workshop on Rewriting Techniques for Program Transformations and Evaluation (WPTE 2015), July 2, 2015, Warsaw, Poland. Open Access Series in Informatics (OASICS), volume 46, Schloss Dagstuhl - Leibniz-Zentrum fuer Informatik. XIV Jornadas sobre Programación y Lenguajes (PROLE'2014), Cádiz, Spain. Revised Selected Papers. Electronic Proceedings in Theoretical Computer Science, volume 173. Grenoble, France, April 5-6, 2014, Revised Selected Papers. Lecture Notes in Computer Science, volume 8663, 296 pages. The 26th International Workshop on Unification, Manchester, UK, July 1, 2012. EPiC Series 24, EasyChair 2014. Functional and (Constraint) Logic Programming, Special Issue of Information and Computation. 10th International Workshop, WRS 2011, Novi Sad, Serbia, May 29,2011, Revised Selected Papers. Electronic Proceedings in Theoretical Computer Science. 18th International Workshop, WFLP 2009, Brasilia, Brazil, June 28, 2009, Revised Selected Papers. Lecture Notes in Computer Science, volume 5979, 180 pages. Santiago Escobar, Catherine Meadows, José Meseguer. Maude-NPA: Cryptographic Protocol Analysis Modulo Equational Properties. FOSAD 2007/2008/2009 Tutorial Lectures, LNCS 5705, pages 1-50. Electronic Notes in Theoretical Computer Science, Volume 234, pages 1-114. Electronic Notes in Theoretical Computer Science, Volume 235, pages 1-152. Demis Ballis, Santiago Escobar, Massimo Marchiori. Electronic Notes in Theoretical Computer Science Volume 200, Issue 3, Pages 1-188. María Alpuente, Santiago Escobar, Moreno Falaschi. María Alpuente, Angel Cuenca-Ortega, Santiago Escobar, Julia Sapiña. Inspecting Maude Variants with GLINTS. Theory and Practice of Logic Programming, Volume 17, Issue 5-6, pages 689-707, September 2017. Constrained narrowing for conditional equational theories modulo axioms. Science of Computer Programming, volume 112, part 1, pages 24-57, 2015. State Space Reduction in the Maude-NRL Protocol Analyzer. Information and Computation, Volume 238, November 2014, Pages 157-186. María Alpuente, Santiago Escobar, Javier Espert, José Meseguer. A Modular Order-sorted Equational Generalization Algorithm. Information and Computation, Volume 235, April 2014, Pages 98-136. Santiago Escobar, Ralf Sasse, José Meseguer. Folding variant narrowing and optimal variant termination. The Journal of Logic and Algebraic Programming, Volume 81, Issues 7-8, pages 898-928, 2012. María Alpuente, Santiago Escobar, José Iborra. Modular Termination of Basic Narrowing and Equational Unification. Logic Journal of the IGPL, Volume 19, Issue 6, pages 731-762. 2010. María Alpuente, Marco Comini, Santiago Escobar, Moreno Falaschi, José Iborra. Theoretical Computer Science, Volume 411, Issue 37, 7 August 2010, Pages 3348-3371. María Alpuente, Santiago Escobar, Bernhard Gramlich, Salvador Lucas. Theoretical Computer Science, Volume 411, Issue 2, 2 January 2010, Pages 504-541. Theoretical Computer Science, Volume 410, Issue 46, 1 November 2009, Pages 4608-4625. Abstract Interpretation and Logic Programming: In honor of professor Giorgio Levi. María Alpuente, Santiago Escobar, Salvador Lucas. Theory and Practice of Logic Programming, Volume 7, Issues 1-2, pages 3-35, 2007. Theoretical Computer Science, Volume 367, Issues 1-2, pages 162-202, 2006. AI Communications, 17(1):35 - 37. María Alpuente, Demis Ballis, Angel Cuenca-Ortega, Santiago Escobar, and José Meseguer. ACUOS2: A High-performance System for Modular ACU Generalization with Subtyping and Inheritance. Lecture Notes in Computer Science, to appear. Antonio González-Burgueño, Damián Aparicio-Sánchez, Santiago Escobar, Catherine Meadows, and José Meseguer. Formal verification of the YubiKey and YUbiHSM APIs in Maude-NPA. In proceedings of 22th International Conferences on Logic for Programming, Artificial Intelligence and Reasoning (LPAR18), Awassa Ethiopia, 16-21 November 2018. EPiC Series in Computing, volume 57, pages 400-417. Fan Yang, Santiago Escobar, Catherine Meadows, José Meseguer. Modular Verification of Sequential Composition for Private Channels in Maude-NPA. In proceedings of 14th International Workshop on Security and Trust Management (STM 2018). Lecture Notes in Computer Science, volume 11091, pages 20-36. María Alpuente, Angel Cuenca-Ortega, Santiago Escobar, Jose Meseguer. Homeomorphic Embedding modulo Combinations of Associativity and Commutativity Axioms. In proceedings of 28th International Symposium on Logic-Based Program Synthesis and Transformation (LOPSTR 2018). Lecture Notes in Computer Science, volume 11408, pages 38-44. In proceedings of 12th International Workshop on Rewriting Logic and its Applications (WRLA 2018). Lecture Notes in Computer Science, volume 11152, pages 26-44. Francisco Durán, Steven Eker, Santiago Escobar, Narciso Martí-Oliet, José Meseguer, and Carolyn Talcott. Associative Unification and Symbolic Reasoning Modulo Associativity in Maude. Lecture Notes in Computer Science, volume 11152, pages 98-114. In proceedings of the 33rd International Conference on Logic Programming (ICLP 2017). María Alpuente, Angel Cuenca-Ortega, Santiago Escobar, José Meseguer. Partial Evaluation of Order-sorted Equational Programs modulo Axioms. In proceedings of 26th International Symposium on Logic-Based Program Synthesis and Transformation (LOPSTR 2016). Fan Yang, Santiago Escobar, Catherine Meadows, José Meseguer, and Sonia Santiago. Strand Spaces with Choice via a Process Algebra Semantics. In proceedings of 18th International Symposium on Principles and Practice of Declarative Programming (PPDP 2016). Built-in Variant Generation and Unification, and their Applications in Maude 2.7. In proceedings of International Joint Conference on Automated Reasoning (IJCAR). Lecture Notes in Computer Science, volume 9706, pages 183-192. Springer 2016. Santiago Escobar, Catherine Meadows, José Meseguer, Sonia Santiago. Symbolic Protocol Analysis with Disequality Constraints Modulo Equational Theories. In proceedings of Programming Languages with Applications to Biology and Security - Essays Dedicated to Pierpaolo Degano on the Occasion of His 65th Birthday. Lecture Notes in Computer Science, volume 9465, pages 238-261. Springer 2015. Manuel Clavel, Francisco Durán, Steven Eker, Santiago Escobar, Patrick Lincoln, Narciso Martí-Oliet, Carolyn L. Talcott. In proceedings of Logic, Rewriting, and Concurrency - Essays dedicated to José Meseguer on the Occasion of His 65th Birthday. Lecture Notes in Computer Science, volume 9200, pages 232-254. Springer 2015. Antonio González-Burgueño, Sonia Santiago, Santiago Escobar, Catherine Meadows, and José Meseguer. Analysis of the PKCS#11 API using the Maude-NPA tool. In proceedings of 2nd International Conference on Research in Security Standardisation (SSR 2015). Lecture Notes in Computer Science, volume 9497, pages 86-106. Springer 2015. Analysis of the IBM CCA Security API Protocols in Maude-NPA. Lecture Notes in Computer Science, volume 8893, pages 111-130, Springer 2014. Elena Lloret, Santiago Escobar, Manuel Palomar, and Isidro Ramos. Incremental and Adaptive Software Systems Development of Natural Language Applications. In proceedings of 22nd International Conference on Information Systems Development (ISD 2013), Sevilla, Spain, September 2-4, 2013. ISBN 978-3-319-07214-2, pages 511-523, 2014. Sonia Santiago, Santiago Escobar, Catherine Meadows, and José Meseguer. A Formal Definition of Protocol Indistinguishability and its Verification Using Maude-NPA. Lecture Notes in Computer Science, volume 8743, pages 162-177, Springer 2014. María Alpuente, Santiago Escobar, Javier Espert, and José Meseguer. ACUOS: A System for Modular ACU Generalization with Subtyping and Inheritance. Lecture Notes in Computer Science, volume 8761, pages 573--581, Springer 2014. Fan Yang, Santiago Escobar, Catherine Meadows, José Meseguer, and Paliath Narendran. Theories of Homomorphic Encryption, Unification, and the Finite Variant Property. A Rewriting-based Forwards Semantics for Maude-NPA. In proceedings of Symposium and Bootcamp on the Science of Security (HotSoS 2014), April 8-9, 2014, Raleigh, NC, USA. Functional Logic Programming in Maude. In proceedings of Specification, Algebra, and Software: A Festschrift Symposium in Honor of Kokichi Futatsugit (SAS 2014), Kanazawa, Japan, 2014. Lecture Notes in Computer Science, volume 8373, pages 315-336, Springer 2014. Unification and Anti-unification modulo Equational Theories. The 27th International Workshop on Unification (UNIF 2013), EPiC - EasyChair Proceedings in Computing, volume 19, page 1, 2013. María Alpuente, Santiago Escobar, Javier Espert. The 27th International Workshop on Unification (UNIF 2013), EPiC - EasyChair Proceedings in Computing, volume 19, page 3-7, 2013. Kyungmin Bae, Santiago Escobar, and José Meseguer. Abstract Logical Model Checking of Infinite-State Systems Using Narrowing. Serdar Erbatur, Santiago Escobar, Deepak Kapur, Zhiqiang Liu, Christopher Lynch, Catherine Meadows, José Meseguer, Paliath Narendran, Sonia Santiago, and Ralf Sasse. Lecture Notes in Computer Science, volume 7898, pages 231-248, Springer 2013. Lecture Notes in Computer Science, volume 7459, pages 73-90, 2012. Serdar Erbatur, Santiago Escobar, and Paliath Narendran. Unification modulo a property of the El Gamal Encryption Scheme. In proceedings of The International Workshop on Unification (UNIF 2012). Serdar Erbatur, Santiago Escobar, Deepak Kapur, Zhiqiang Liu, Christopher Lynch, Catherine Meadows, Jose Meseguer, Paliath Narendran and Ralf Sasse. In proceedings of The International Workshop on Unification (UNIF 2011). Santiago Escobar, Deepak Kapur, Christophe Lynch, Catherine Meadows, José Meseguer, Paliath Narendran, and Ralf Sasse. In proceedings of 13th International ACM SIGPLAN Symposium on Principles and Practice of Declarative Programming (PPDP'2011). Francisco Durán, Steven Eker, Santiago Escobar, José Meseguer and Carolyn Talcott. Ralf Sasse, Santiago Escobar, Catherine Meadows, José Meseguer. Protocol Analysis Modulo Combination of Theories: A Case Study in Maude-NPA. Lecture Notes in Computer Science, Volume 6710, pages 163-178, 2011. Mauricio Alba-Castro, María Alpuente, Santiago Escobar. Confidentiality Certification of source Java code in JavaPCC. In proceedings of 10th International Workshop on Automated Verification of Critical Systems (AVOCS 2010). Approximating Non-interference and Erasure in Rewriting Logic. In proceedings of 12th International Symposium on Symbolic and Numeric Algorithms for Scientific Computing (SYNASC 2010). M. Alba-Castro, M. Alpuente, S. Escobar. Lecture Notes in Computer Science, Volume 6286, pages 105-124, 2010. LNCS 6345, pages 303-318. 2010. Santiago Escobar, José Meseguer, Ralf Sasse. LNCS 6381, pages 52-68. 2010. A Graphical User Interface for Maude-NPA. In IX Jornadas sobre Programación y Lenguajes (PROLE 2009). Electronic Notes in Theoretical Computer Science, volume 258, number 1, pages 3-20. Elsevier, 2009. Manuel Clavel, Francisco Durán, Steven Eker, Santiago Escobar, Pat Lincoln, Narciso Marti-Oliet, José Meseguer and Carolyn Talcott. In proceedings of 20th International Conference on Rewriting Techniques and Applications (RTA'09), LNCS 5595, pages 380-390, 2009. In proceedings of 15th International Conferences on Logic for Programming, Artificial Intelligence and Reasoning (LPAR08), Doha, Qatar. LNCS 5366, pages 317-331, 2008. LNCS 5596, pages 182-198, 2008. LNCS 5283, pages 548-562, 2008. María Alpuente, Santiago Escobar, José Meseguer, Pedro Ojeda. LNCS 5438, pages 24-39, 2008. Electronic Notes in Theoretical Computer Science, volume 246, pages 27-38, 2008. Electronic Notes in Theoretical Computer Science, volume 248, pages 19-29, 2008. LNCS 5117, pages 79-93. 2008. LNCS 5117, pages 1-16. 2008. In LICS-CSF short papers 21st IEEE Computer Security Foundations Symposium (CSF) and 23rd IEEE Symposium on Logic in Computer Science (LICS). , Pittsburgh, USA. Mike Katelman, José Meseguer, Santiago Escobar. Santiago Escobar, Joe Hendrix, Catherine Meadows, José Meseguer. In informal proceedings of 2nd International Workshop on Security and Rewriting Techniques (SecReT 2007), 2007. LNCS 4916, pages 200-217, 2008. LNCS volume 4533, pages 153-168, 2007. Electronic Notes in Theoretical Computer Science, volume 171, pages 23-36, 2007. Santiago Escobar, José Meseguer, Prasanna Thati. Electronic Notes in Theoretical Computer Science, volume 177, pages 5-33, 2007. In proceedings of Midwest Security Workshop (MSW'2006), Urbana, IL, USA. 2006. In proceedings of VI Jornadas sobre ProgramaciÃ³n y Lenguajes (PROLE'2006), Sitges, Spain. 2006. Superseded by this journal publication. In proceedings of Quintas Jornadas sobre Programación y Lenguajes, PROLE'05, 2005. In proceedings of 16th International Conference on Rewriting Techniques and Applications (RTA 2005). In proceedings of International Symposium on Logic Based Program Synthesis and Tranformation (LOPSTR 2004). Francisco Durán, Santiago Escobar, Salvador Lucas. Proc. of 5th International Workshop on Rule-Based Programming, RULE'04. Electronic Notes in Theoretical Computer Science, 124:25-39, 2005. Electronic Notes in Theoretical Computer Science, 117:263-284. 2005. In Proceedings of the IV Jornadas sobre Programación y Lenguajes (PROLE'04), pages 125-136, 2004. In Proceedings of the IV Jornadas sobre Programación y Lenguajes (PROLE'04), pages 97-100, 2004. Pre-proceedings of International Symposium on Logic Based Program Synthesis and Tranformation (LOPSTR), 2004. 4th Int'l Workshop on Rewriting Logic and its Applications (WRLA 2002), Pisa (Italy). Electronic Notes in Theoretical Computer Science, Vol. 71, 2004. In Y. Kameyama and P. Stuckey, editors, Proc. of the 7th International Symposium on Functional and Logic Programming (FLOPS'2004). LNCS 2998, pages 147 - 162, 2004. María Alpuente, Demis Ballis, Santiago Escobar, Moreno Falaschi, Salvador Lucas. In L. Palopoli, editor, Proc. of the APPIA-GULP-PRODE 2003 Joint Conference on Declarative Programming (AGP'03). In Proc. of the Fifth ACM-SIGPLAN International Conference on Principles and Practice of Declarative Programming (PPDP'03), pages 113-123, 2003. In Proc. of the 4th International Workshop on Rule-Based Programming (RULE'03). In G. Vidal, editor, Pre-proceedings of the 12th Int'l Workshop on Functional and (Constraint) Logic Programming (WFLP'03). Superseded by this ACM publication. 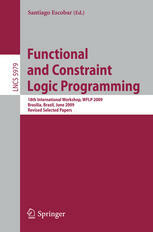 In G. Vidal, editor, Proceedings of the 12th Int'l Workshop on Functional and (Constraint) Logic Programming (WFLP'03). Electronic Notes in Theoretical Computer Science, volume 86, issue 3. 2003. María Alpuente, Marco Comini, Santiago Escobar, Moreno Falaschi, Salvador Lucas. LNCS 2664, pages 1-16, 2003. María Alpuente, Rachid Echahed, Santiago Escobar, Salvador Lucas. In Proc. of the 11th International Workshop on Functional and (constraint) Logic Programming (WFLP'2002), Grado (Italy). Electronic Notes in Theoretical Computer Science, Vol. 76. Proc. of 3rd International Workshop on the Implementation of Logics. Tbilisi, Georgia, October 2002. Proc. of the 12th Int'l Workshop on Logic-Based Program Synthesis and Transformation (LOPSTR 2002), Madrid (Spain). In Proc. of the 4th Int'l Workshop on Rewriting Logic and its Applications (WRLA 2002), Pisa (Italy). Research Report UDMI/18/2002/RR, pages 255-268. July 2002. LNCS 2422, pages 117-131, 2002. Departamento de Sistemas Informáticos y Computación, UPV, 2004. Departamento de Sistemas Informáticos y Computación, UPV, 2003. Technical report DSIC, DSIC-II/9/02, 2002, 19 pp. UPV-Curry: An Incremental Curry Interpreter with Polymorphic Types and Monadic I/O. Technical report DSIC-II/12/99, UPV, 1999. Available: Abstract / DVI / PostScript / BibTeX entry. Santiago Escobar, María Alpuente, Salvador Lucas. Technical report DSIC-II/38/98, UPV, 1998. Modelización conceptual declarativa en un lenguaje lógico-funcional avanzado. Technical report DSIC-II/39/98, UPV, 1998. Santiago Escobar, María Alpuente, Salvador Lucas, Germán Vidal. UPV-Curry: Un intérprete de Curry con tipos polimórficos y E/S monádica. Technical report DSIC-II/40/98, UPV, 1998. PhD advisors: María Alpuente and Salvador Lucas. Examiners: Hélène Kirchner, Francisco López-Fraguas, José Meseguer, Isidro Ramos, and Albert Rubio. Available: Abstract / Gzipped PostScript / PDF / BibTeX entry.